In biology, everything is curvy! A new digital camera developed by scientists takes its inspiration from the compound eyes of insects. 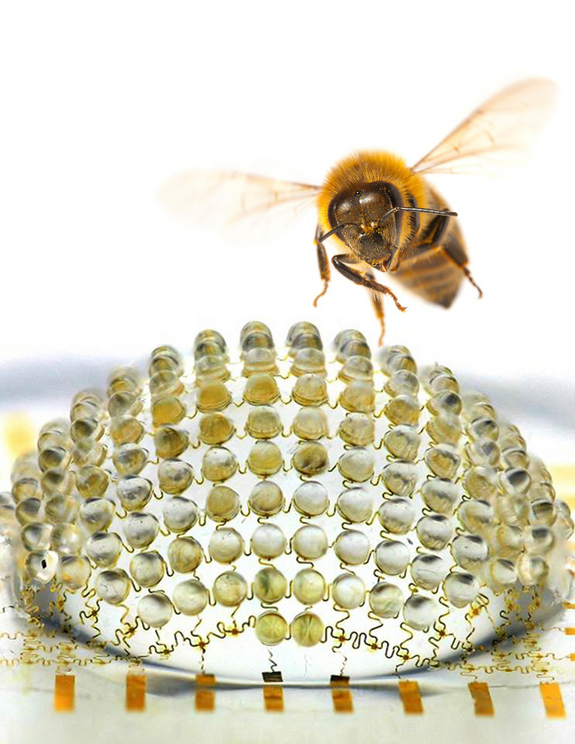 An insect-inspired camera developed by John Rogers, a materials scientist at the University of Illinois at Urbana-Champaign and announced in Nature May 1, consists of a hemispherical surface studded with a dense array of lenses and photo detectors. Insects have a wide field of view and are acutely sensitive to motion, as anyone who has tried chasing a housefly knows. The compound eyes of insects have many advantages: a wide field of view, good motion sensitivity and an infinite depth of field (the distance between objects in the image that appear sharp). Each eye contains hundreds to thousands of imaging units called ommatidia — each with a tiny lens and crystalline cone that transports the light to light-sensitive cells. Like insect eyes, the camera has a wide field of view; about 160 degrees, or almost half a sphere, simulations suggest. It could be used where wide viewing angles are important and space is at a premium — in advanced surveillance systems for example, or in unmanned flying vehicles and endoscopes. Today’s digital cameras‘ charge-coupled devices, or CCDs, are built on flat (planar), rigid silicon wafers. The breakthrough that Rogers and his team have been working on, and which makes this possible, is to develop sensors that are curved. This has already had an application by Monash University researchers working on the first artificial retina. The new device, which Rogers and his colleagues describe today in Nature, comprises an array of microlenses connected to posts that mimic the light-funnelling cones of ommatidia, layered on top of a flexible array of silicon photodetectors. The lens–post pairs are moulded from a stretchy polymer called an elastomer. A filling of elastomer dyed with carbon black surrounds the structures, preventing light from leaking between them. The lens is about 1 centimetre in diameter. The whole thing is stretchy and thin, and we blow it up like a balloon” so that it curves like a compound eye, says Rogers. The current prototype produces black-and-white images only, but Rogers says a colour version could be made with the same design. Rogers made the device work by predicting the mechanics of how his designs would stretch before building them — to make sure that the lenses would not be distorted when the device was inflated, for example. 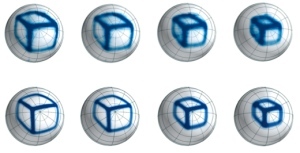 Images of a box captured at four different distances from the camera (top row), compared with a computer simulation of the camera’s performance (bottom row). Rogers describes the camera as a “low-end insect eye” which contains 180 artificial ommatidia, about the same number as in the eyes of a fire ant (Solenopsis fugax) or a bark beetle (Hylastes nigrinus) — insects that don’t see very well. So far the researchers have tested it by taking pictures of simple line drawings (see image). Rogers says that his next project is to go “beyond biology”, by inflating or deflating the camera to adjust its field of view.